These wee guys don’t look like much right now but by next year they should be huge, and in addition to providing yummy stalks for pies, crumbles and jam, they’ll also provide some much needed “fill” to that section of the backyard. With Zeus gone, we’ve been doing a lot of work to turn what was his lavatory into a much more attractive space. I’m rehabilitating what was likely once a very nice naturalized woodland garden but in recent years has become a tangled mess of weeds and rampant choke cherry trees. So far in their place are some hostas, some coral bells, purple coneflower, meadow sage, lupins and a couple ferns. Oh yeah, and that’s only half of the bed planted. Whew! Getting back to the rhubarb. I have to admit that as a kid I wasn’t much of a fan of the stuff. I think I enjoyed playing with the giant leaves, wearing them upside down as big hats, than I enjoyed eating it. I think it was just too sour for me to really love. But now I have a whole new appreciation for this robust, carefree…fruit? I want to experiment with some new ways to use it. In order to get some of my own started, I had thought I’d have to wait until June when we’re scheduled to visit Chris’s parents neck of the woods, to get some crowns from his mom. She was the only person I could find that had some to spare. But in my persistent hunting I finally came across some plants at Home Depot, of all places. They were hidden in the very back and I don’t know how I found them. 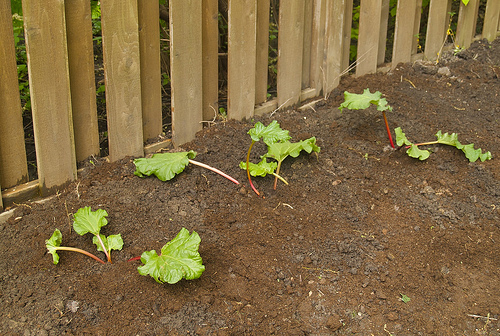 This variety is called “Canada Red.” I had plenty of composted horse manure left from a month ago when my parents brought me a load, and rhubarb loves composted manure. 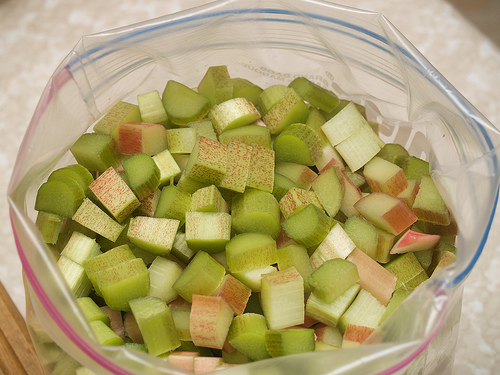 Chris’s mom gave me a giant batch of rhubarb stalks last weekend, of which I cut up and froze all but a couple cups to make rhubarb crisp with, which was delish. 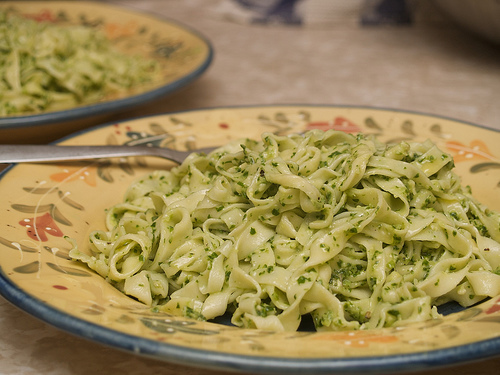 I’ve also been a bit negligent in posting another amazing spring eat: wild leek pesto. Holy smokes people. If you haven’t ever tried wild leeks, you don’t know what you’re missing. This recipe was in the early summer 2009 issue of Food & Drink magazine, published by the LCBO. I have been using the new pasta maker Chris gave me for Christmas and this dish turned out fabulous. Wild leeks can be a bit hard to find, but I live less than two blocks from Pusateri’s. 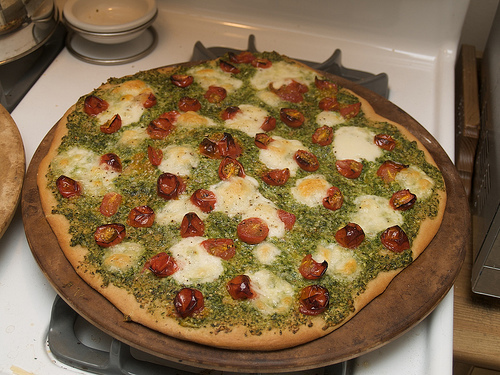 Since we had plenty of the pesto left over, we used it to make the most incredible pizza the following evening, with boccocini and slow-roasted cherry tomatoes. Using a food processor, pulse pine nuts until roughly chopped. Add leeks, spinach and olive oil and process until slightly chunky. Stir in Parmesan cheese, salt and pepper. Serve on pasta or use as base for pizza, on crostini, etc.